Toggled 4-foot (48-inch) HIGH-OUTPUT 23-watt (3100 lumens) direct-wire LED tubes are designed to replace T8/T12 fluorescent tubes and offer an economical alternative to high intensity discharge (HID) lighting to significantly lower energy and maintenance costs while enhancing the quality of light in work environments. This Day Light (5000K) HIGH-OUTPUT LED bulb delivers a whiter light for improved color contrast and is a popular choice for commercial/industrial environments with elevated ceilings (such as: warehouses, gymnasiums and similar lighting applications). Ideal for high bay and shop fixture applications. Following a simple retrofit process to bypass the ballast system, toggled LED tubes work within existing fluorescent light fixtures offering the additional benefits of eliminating ballast replacement costs, buzz noise and light flicker. 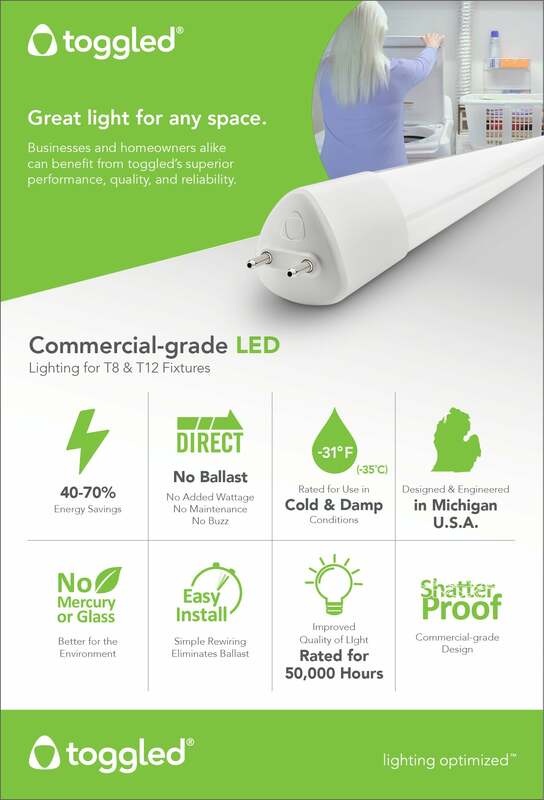 Proudly designed and engineered in Troy, Michigan U.S.A., toggled's patented, commercial-grade LED tube design uses less energy than traditional fluorescent tubes and is rated for 50,000 hours with a *limited 6-year commercial warranty. Bypass the Ballast and Hassle: Eliminate ballast energy use, noise, flicker, failure and replacement costs. Simple rewiring required (10-15 minutes on average), step-by-step instructions.